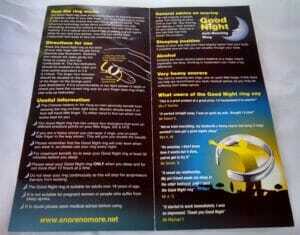 The Goodnight Anti-snoring ring is a non-invasive method used to stop snoring. This product is a great natural form of medicine that does not involve awkward mouthpieces or painful nose strips. More than 90 million Americans and 15 million British suffer from snoring currently and can choose from 852 anti-snoring devices, many of which are not as simple and effective as the Goodnight Anti Snoring Ring. The ring does not have any side effects and will keep you out of harm’s way. Acupressure, very similar to acupuncture, is a type of alternative medicine. Acupuncture stimulates acupuncture points with the use of needles; whereas acupressure is based more on applying pressure to those points instead. Typically, the pressure is applied by using an index finger, thumb, elbow, hand, knee, or another device. Both of these forms of ancient medicine were first used the by the Chinese dating back to 3,000B.C. in order to balance yin, yang, and qi (or chi). 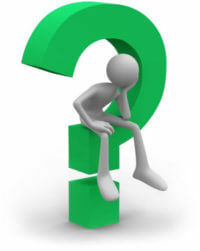 There have actually been more studies conducted clinically on acupuncture and its effectiveness and roles in healing. One major added benefit of acupressure, over acupuncture, is that acupressure can be used on a person who is not fond of needles. Even though acupuncture is normally a painless treatment, people can become extremely uncomfortable with needles on their body, leaving acupressure the more realistic solution. Acupressure treats symptoms that include snoring, stress, depression, nausea, and other pains. These treatments are said to promote endorphin release. Endorphins are natural pain relieving chemicals in your body. The Small- Medium size ring measures 15.5 mm – 18 mm in diameter. The Medium-Large size ring measures 17 mm to 19 mm in diameter. The Large- X-Large size ring measures 18.5 mm to 20 mm in diameter. The actual metal material that the ring is made of is sterling silver. The Ring is only fully functional when worn and it is best to use it every night for more consistent results. The recommended use is to slip the ring on at least 30 minutes prior to bedtime. You should avoid wearing the ring for longer than 12 hours. Simply remove the ring in the morning once you get out of bed. The ring can effectively start working during your very first use, however in some adults, it may take up to 4 days to see results. The ring functions by applying the basic principles of acupressure. 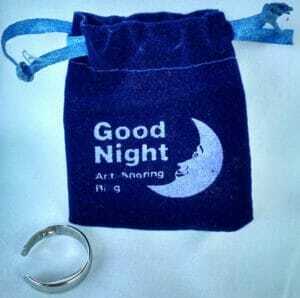 Using the Good Night ring is quite simple. About thirty minutes before you are ready to go to sleep, slide the ring onto your pinkie finger with the opening of the ring facing in the upright position. Then, push the sides of the ring inward so that you are gently fitting the ring to your finger. You want the ring to be comfortable on your finger, but firm at the same time. Be sure to carefully read the instructions included with your ring, as you must be sure the large acu-activator is on the outside of your hand. If your pinkie was being used as a clock, you want the activators to be at the 3 o’clock and 9 o’clock positions to properly work. The ring itself presses on points located on the sides of the little finger, or at the base of the little finger between the knuckle and joint areas. The central nervous system is then stimulated by the pressure. As a result, this reduces sinus swelling and drains the nasal cavities and thus reducing any congestion in the nasal area. The image here shows how the ring actually performs. The thick, flat side of the ring, which is on the outside of your hand, applies slight pressure on your little finger. The small bump towards the inside of your finger applies pressure from the opposite end. This combination of pressure is the acupressure! The manufacturer advertises the ring as $43.49 + $2.89 shipping. However, there are other sellers of the product retailing them for a significantly higher price online with free shipping. This item comes with a money back guarantee. The manufacturer advertises that this product can be fully refunded with no questions asked. There are several reviews for this ring online. Many users say that initially, they were skeptical about purchasing the item because it is a natural medicine with bias associated with the effectiveness. However, many of the purchasers commented that this item does actually work and they were extremely happy with the quality and outcome of the purchase. 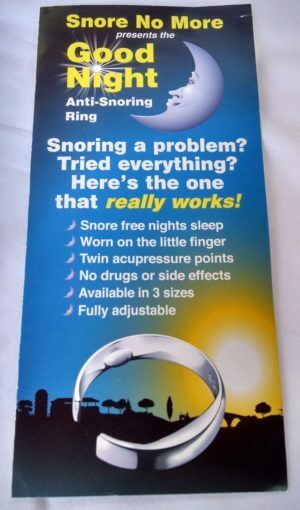 There are a few other Anti – Snoring Rings available on the market. There seems to be some question as to who was the “original” Anti – Snoring ring, however, it all comes down to the actual effectiveness and quality of the product, not necessarily the manufacturer anyway! 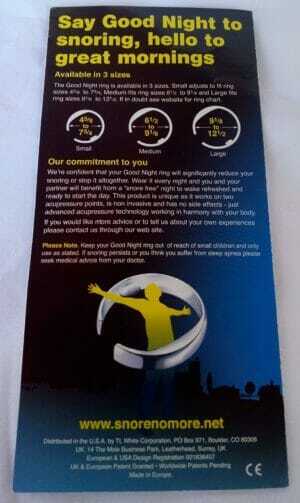 I received the Good Night Snore No More ring promptly in the mail. The ring was neatly packaged in a small blue velvet pouch and came with a folded pamphlet. The ring is lightweight and is silver in color. You can see the .925 stamp on the ring pictured in the brochure. This stamp signifies it’s sterling silver. The acupressure bump is very clear on the one side of the ring. The other acupressure point is located on the opposite side of the ring – you can recognize this by seeing a difference in the thickness of the ring. These opposite acupressure points are what stimulate the central nervous system and thus reduce swelling, clear the nasal cavities, and reduce snoring. Place the Good Night ring on your little finger with the Acu-Activator on the inside of your little finger next to your ring finger. The thicker part of the ring called the Large Acu-Activator should be on the outer side of your little finger. The ring can be worn on either pinkie finger, but just be aware of the positioning of the Acu-Activators. If you are wearing the ring on your left hand, the small Acu-Activator bump will be on the right side of your pinkie. If you are wearing the ring on your right hand, the small Acu-Activator bump will be on the left side of your pinkie. Once the ring is positioned correctly, twist the ring so that gap is facing upwards. Gently squeeze and release the sides of the ring so you have a firm yet comfortable fit. If you think the ring is too tight, loosen the fit a bit. It’s best to wear the ring at least 30 minutes prior to sleeping and to wear the ring for no more than 12 hours. If it’s worn continuously, it will stop the acupressure therapy from working altogether. If you are staying true to traditional Yin Yang Chinese beliefs, then men should wear the Snore No More Ring on their right pinkie finger, and women should wear it on their left. Try it both ways to see which works best for you. You can also use two rings at a time, one on each pinkie finger, if you are a heavy snorer. I grabbed the Good Night ring just as I was getting ready for bed. I figured I would first test the Yin Yang theory and place the ring on my right pinkie finger. I made sure the small Acu-Activator was located on the left side of my pinkie and the opening was facing towards the ceiling. I gently tightened the ring until I felt a bit of pressure, but I also made sure it was comfortable enough to not distract me from falling asleep. As usual, after a long day at work, I was asleep in no time. The next morning I woke up feeling refreshed and really put the ring to the test by getting the “wife test”. I asked my wife how my snoring was during the night and she couldn’t recollect hearing anything. That’s always a relief to hear, right? I was surprised myself to hear that this natural non-invasive method may actually be the trick to stop snoring. After passing the “wife test”, I continued back to the bedroom to remove the ring and store it in the velvet pouch until later that evening. I have to recommend this product to anyone looking for an alternative solution to stop snoring. A great feature this product has to offer is the fact that you don’t need to use a traditional mandibular device to stop your snoring. Sometimes those mouthpieces can be uncomfortable, difficult to fit, and expensive. 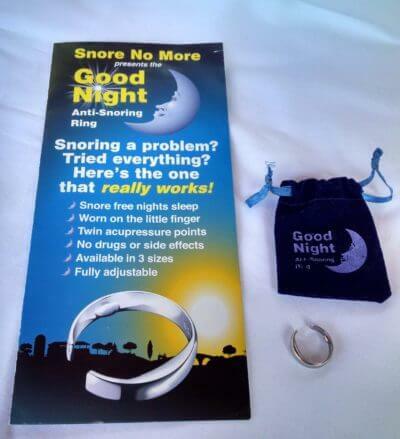 The Good Night Anti-Snoring Ring is an effective non-invasive product that really does the trick to stop snoring. Do you currently own the Goodnight Anti Snoring Ring or would like to ask a question about the product? Are you looking to purchase the snoring ring and need more specifications? Feel free to leave a comment below. Next post: Snoring Mouthpiece for smaller mouths – Mouthpiece is too big, what alternatives are available?